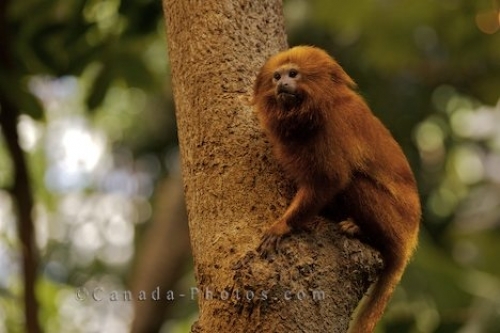 This fuzzy brown animal is a Golden Lion Tamarin that resides at the Biodome de Montreal in Montreal, Quebec. This Golden Lion Tamarin uses his sharp claws to cling to the tree in his habitat of the Tropical Forest at the Biodome de Montreal in Montreal, Quebec. An animal that is high on the endangered species list with only about 1,000 left in the wild and about 500 in captivity with the one in this picture residing in Montreal. Golden Lion Tamarin, Leontopithecus rosalia, in the Tropical Forest at the Biodome, Biodome de Montreal, Hochelaga-Maisonneuve, Montreal, Quebec, Canada. Picture of an animal in the monkey family known as the Golden Lion Tamarin at the Biodome de Montreal in Montreal, Quebec.